Since the EU won't ask them, Saharawi groups have once again been left with no other choice than to contact EU institutions themselves to indicate they do not want the EU-Morocco Fisheries Agreement applied to their waters. Close to 100 Saharawi civil society organisations have signed an appeal to Members of the European Parliament (MEPs), asking them to vote against the proposed EU-Morocco Sustainable Fisheries Agreement that includes the waters of occupied Western Sahara and is up for a vote in plenary on 13 February. "This deal has nothing to do with a “sustainable fisheries partnership agreement”. It is not sustainable: to this date, the Commission still does not have any independent data concerning the fisheries reserves in our waters and has relied exclusively on information provided by the Moroccan authorities or the pro-Moroccan industry. There is no partnership: the Commission did not carry out any genuine consultation of our people and it has negotiated with Morocco an agreement, which ignores our interests and wishes. Finally, it is not about fisheries but only about geopolitics: pleasing an illegal occupying force in exchange of its support for the EU agenda on migration or other interests", the letter reads. 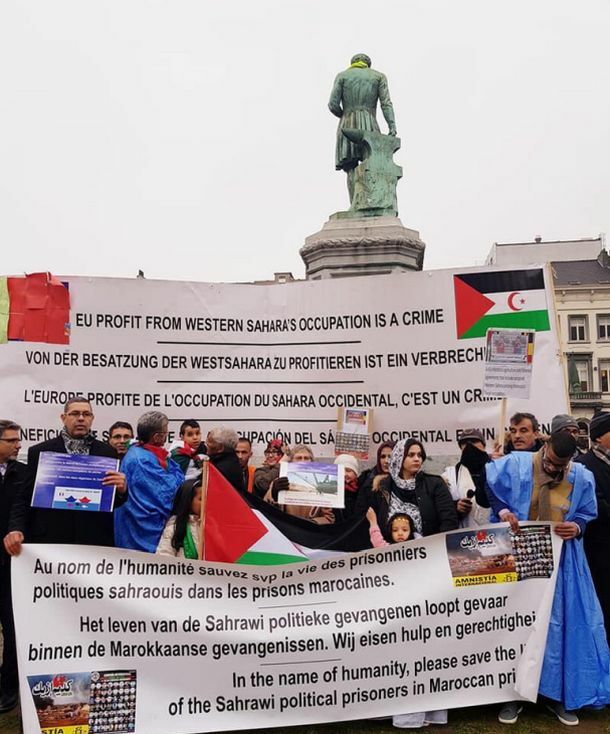 The letter was sent to all MEPs today, after Saharawis staged a protest in Brussels in front of the European Parliament (see photos, and click for higher resolution). Read the full version of the letter below, or download it here. On behalf of Saharawi civil society and the undersigned civil society organizations from the occupied territories of Western Sahara, the liberated territories, the refugee camps in Tindouf and the Saharawi diaspora, we wish to share our opinion and position on the proposed EU-Morocco sustainable fisheries partnership agreement and the inclusion of Western Sahara in its territorial scope. The EU’s Court of Justice (CJEU) has twice (on 21 December 2016 and 27 February 2018) ruled that Western Sahara is separate and distinct from Morocco, that Morocco has no sovereignty over the territory of Western Sahara and that the EU-Morocco agreements are not applicable to Western Sahara. The Court has also stipulated the consent of the people of Western Sahara as the principle pre-condition for the application of such agreements in Western Sahara as a non-self-governing territory. We are disappointed by the Council’s approval of an agreement that aims to illegally plunder the natural resources of our occupied homeland - Western Sahara – and contributes directly to the prolongation of the occupation, the suffering of the people of Western Sahara and strengthens the illegal, military presence of Morocco in our territory. 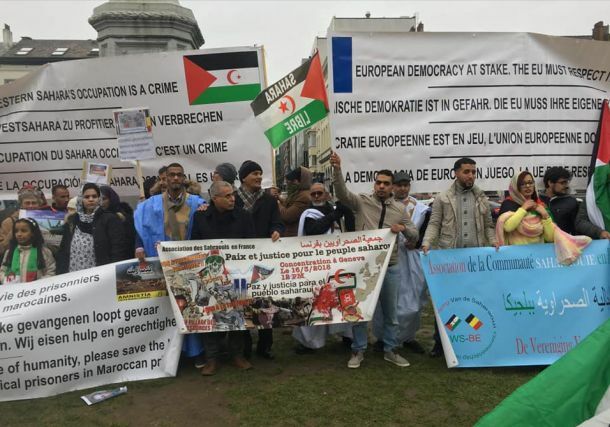 Instead, the EU should support the UN peace process and UN Special Envoy Mr. Köhler’s efforts to resume negotiations between the POLISARIO Front and the Kingdom of Morocco and contribute constructively to formally decolonize Western Sahara. This deal has nothing to do with a “sustainable fisheries partnership agreement”. It is not sustainable: to this date, the Commission still does not have any independent data concerning the fisheries reserves in our waters and has relied exclusively on information provided by the Moroccan authorities or the pro-Moroccan industry. There is no partnership: the Commission did not carry out any genuine consultation of our people and it has negotiated with Morocco an agreement, which ignores our interests and wishes. Finally, it is not about fisheries but only about geopolitics: pleasing an illegal occupying force in exchange of its support for the EU agenda on migration or other interests. We urge you, Honorable Members of the European Parliament to vote AGAINST the proposed EU-Morocco fisheries agreement to save the EU’s image as an international institution that has been always presented as a “global leader” in defending democracy, human rights and the rule of law. We call upon you all to take your constitutional responsibilities and act as legislative power, stand up to defend your own court and not to be seduced by propaganda and baseless claims of « benefits » by the EU Commission. The Saharawi civil society trusts that the Parliamentarians will understand for themselves the reality of dispossession, repression and demographic engineering that is occurring in occupied Western Sahara and that the proposed agreement will only prolong. Therefore, a referral to the CJEU can be an alternative option for those who still have doubts about the clarity of the CJEU rulings related to the same agreements. We will be following your vote next week and we wish to see the majority of the members of this house defending the legality and our people’s right not to lose faith in the European Parliament and the entire EU politics.